the lower end of the paving is necessary to prevent this creep. Figure 1 shows a typical section through an anchor beam. 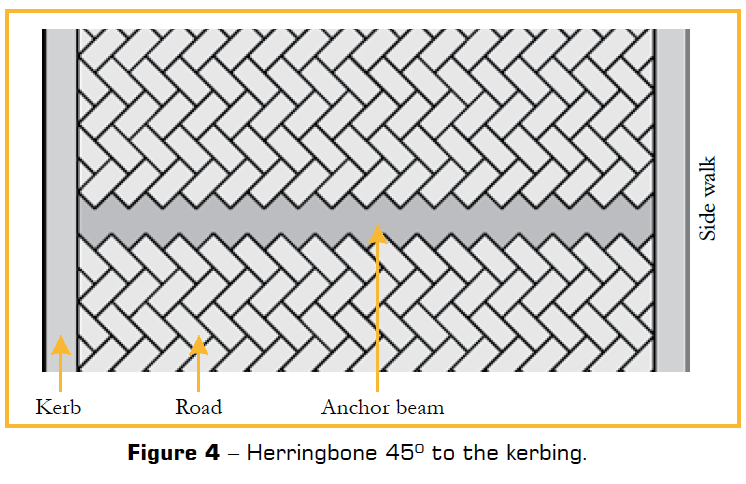 Anchor beams should be used on roads where the slope is greater than 12%. 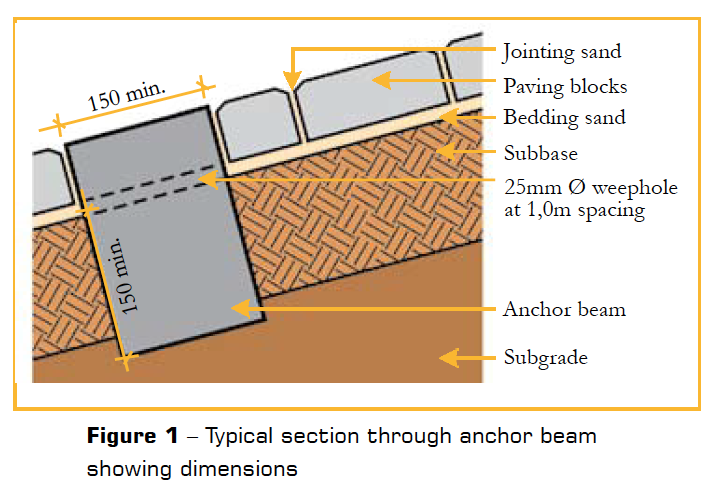 Between 8% and 12% anchor beams should be used at the discretion of the engineer. It is standard practice when laying cbp to start at the lower end and to work upwards against the slope. This practice will ensure that if there is any movement of blocks during the laying operation, it will help to consolidate the blocks against each other, rather than to open the joints. If one is constructing a road over undulating topography, it is suggested that one begins at the low point of the dip and work away in both directions simultaneously. No anchor beam is required at the low point. For ease of construction, it is recommended that the blocks are laid continuously up the gradient. Thereafter, two rows of blocks are uplifted in the position of the beam, the subbase excavated to the required depth and width and the beam cast, such that the top of the beam is 7-10mm lower than the surrounding block work. 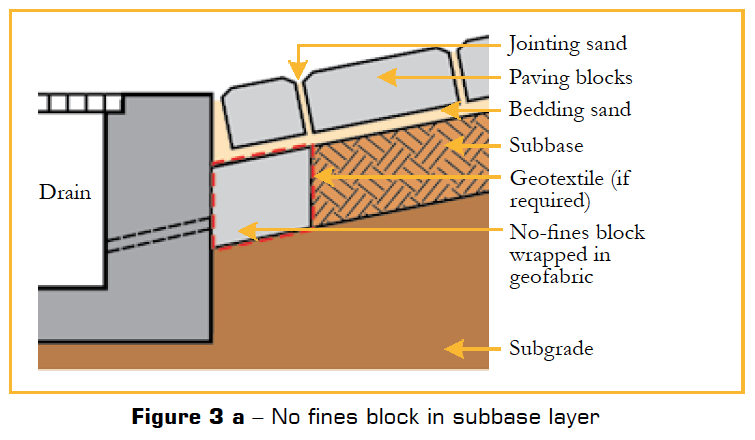 This allows for settlement of the pavers. This method of construction will ensure that the anchor beam interlocks, with the pavers and eliminates the need to cut small pieces of block. lead to softening of the subbase, settlement, and possible pumping. 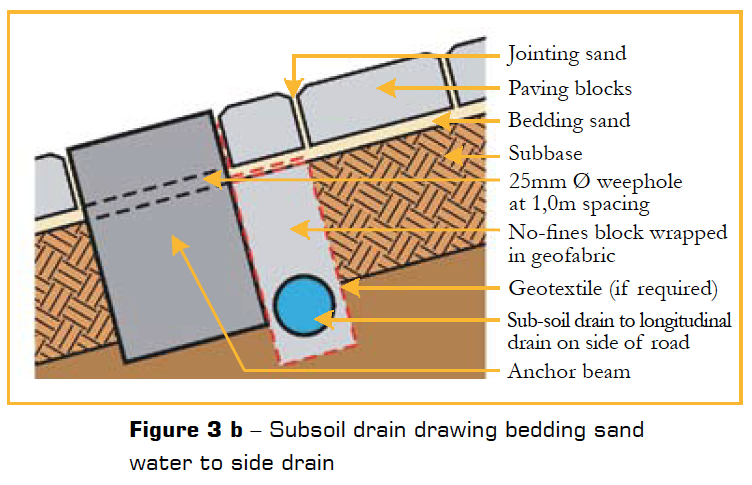 To eliminate this problem, it is important to provide subsoil drainage, immediately upstream of the anchor beam. Figure 3 shows two methods of achieving this. In addition weepholes should be cast into the anchor beam. Sealing of the joints with a proprietary sealer. As a result of the forces described previously, there could be a small amount of horizontal creep and sliding of the blocks due to the horizontal consolidation of the jointing sand. This could result in an opening up of the top edge joint. Although this gap does not affect the structural integrity of the pavement, it does need addressing as it can lead to ingress of water. Typically, the pavement should be monitored after 3-6 months, and if a joint has opened up, it should be filled with jointing sand or a bitumen sealant.